Saturday Lauren and I went to the Co Prosperity Sphere to check out the NFO XPO. In all honesty I hadn’t been to a Version festival in three years. Three years ago both myself and several friends were stranded in Bridgeport at 2am in the rain and miles from the train (no taxis would come pick us up and the bus had stopped running). So, with that incident behind me, I returned to Version Fest in a car and with a fresh amount of optimism. The layout of the fair looked liked most art fairs in the sense that each artist/organization/gallery had an individual booth and objects were either being sold/bartered/given away. 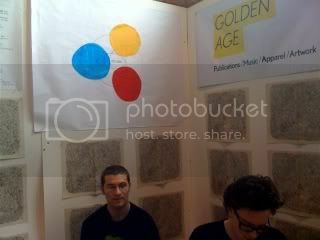 Golden Age, manned by the always rad Marco Kane Braunschweiler (pictured right), was one of my favorite booths. They carried work by Robin Camron. I was really into Camron’s “Mind Maps” and picked up her most recent book also titled “Mind Maps” which maps the artist’s thoughts through extended Venn diagrams. My overall feeling when I left was that I liked some portions of Version but wished there were more participants. 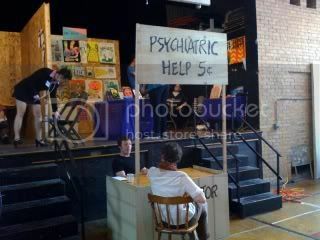 And being the optimist that I surprisingly am, I think that more participation will come over time.